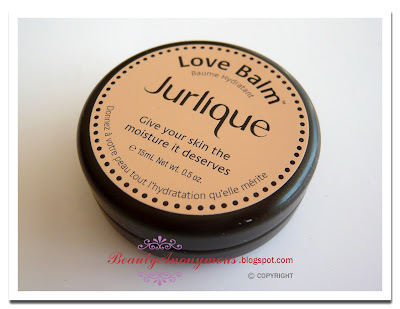 I have been using Jurlique's Love Balm everyday since this winter. In the beginning, I wanted to try a lip balm that is natural and organic-based without any artificial fragrances. Love Blam caught my attention for its all natural ingredients and citrusy scent. Love Balm is a multi-use product for anywhere from head to toe. 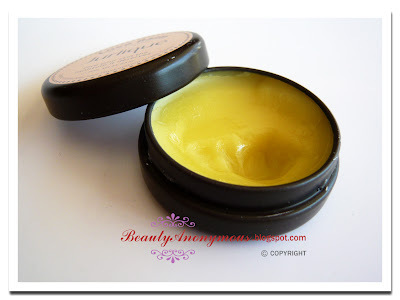 I only use the Love Balm on my lips as I prefer to use separate skincare items for the body. The yellow-colored balm smells like a fresh and crisp tangerine. It is pretty stiff and solid in the tin, but melts right away on skin. It goes on so light and thin that it absorbs very quickly. For people who hate greasy lip balm, I can tell you that Jurlique Love Balm does not feel sticky or waxy at all. The only drawback is it wears off slightly more easily than my other lip balms. I like to slather a generous amount of it before going to bed, which leaves my lips soft, moisturized and nicely healed the next morning. Overall, I am very pleased with Jurlique Lip Balm, and I hope to get my hands on its sister version, Rose Love Balm, whenever it is available on Jurlique's US website. I've meaning to try to for a while now. I really should get it especially Jurlique products are easy to get in Australia. Mmmm just the fact that you said it has a citrusy scent is making me want this!